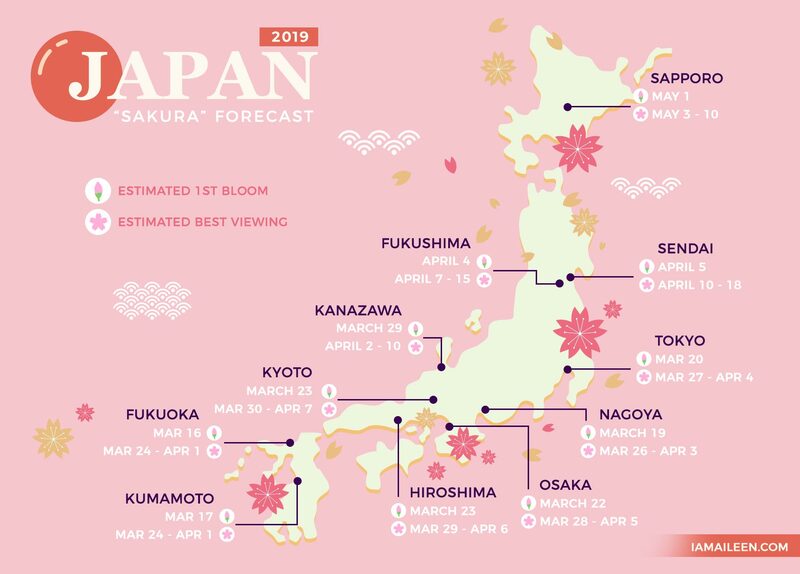 DISCLAIMER: The above data is as of February 22, 2019 and it is based from the forecast done by the Japan Meteorological Corporation. Take note that sudden changes in temperature, rainfall and wind strength can accelerate, delay or shorten the forecast above — but you can already use this initial forecast as a preliminary guide. Rest assured, I will keep this post updated once dates happen to change so come drop by from time to time. To better streamline this section, I will be listing the best cherry blossom spots by region. (FYI: Japan has 8 big regions and each of them are sectioned into prefectures that all total to 47). TRIVIA: Hanami or “flower viewing” is an ancient tradition in Japan wherein locals take the time to enjoy the cherry blossoms or sakura trees. Nowdays, the Japanese typically celebrate it by having an outdoor party or picnic under the trees during daytime or nightime (called as yozakura or “night sakura“). TIP: Discover the beauty of Mt. Fuji up close as well as its nearby natural attractions by going on a day tour from Tokyo! Or if you come sometime around April 14 to May 27, you can take part in the limited-time Shibazakura Festival near Mt. Fuji where you can witness a field of unique pink moss! TIP: Ride the charming Sagano Scenic Railway that goes along Arashiyama to Kameoka. It’s a great way to soak in the cherry blossom views around you given the train’s clear glass ceiling. Osaka Castle: Naturally, a stop here is warranted due to the 4,000 sakura trees that surround it. And if I may share a tip, the Nishinomaru park on the western side of the castle is great for doing picnics as it gives great scenic views of the tower. TIP: From Osaka, you can also do a day tour with KKday to Kyoto’s Arashiyama and Nara’s deer park to enjoy the sakura season! TIP: You can easily go to these 2 places by going on a day tour from Tokyo! Or if you come sometime around April 14 to May 27, you can take part in the limited-time Shibazakura Festival near Mt. Fuji where you can witness a field of unique pink moss. TIP: From Nagoya, you can go on a day trip to the famous World Heritage Site of Shirakawa-go to enjoy its picturesque traditional houses that are amidst pink cherry trees. Matsumae Park: It is famous for having a longer cherry blossom season (lasting almost an entire month) given the wide range of sakura tree varieties in its grounds. Nearby, you can also enjoy the Matsumae Castle which is the only castle on Hokkaido. How to get the best flight deals to Japan? To search for the best accommodations at the best prices in any place in Japan, I suggest checking out Agoda and Booking.com. If you’re rather interested in renting affordable yet comfortable houses or apartments, check AirBnB. How can I go around Japan? If you ever have a hard time navigating yourself through the country’s dense transportation systems, I would recommend using Google Maps for mapping out your day-to-day route because it will show in detail the fastest connections you can do (by walking, by car, by bus, and by train). I use it a lot in my travels and it’s very accurate! You can download areas on the map so you can use it offline, but it’s best to have your own pocket WiFi or SIM Card to stay connected online. If you’re NOT a citizen of any of Japan’s exempted countries, you are then required to avail a visa beforehand. If you’re from the Philippines, you can read my guide on how to get a Japan visa in Manila here. 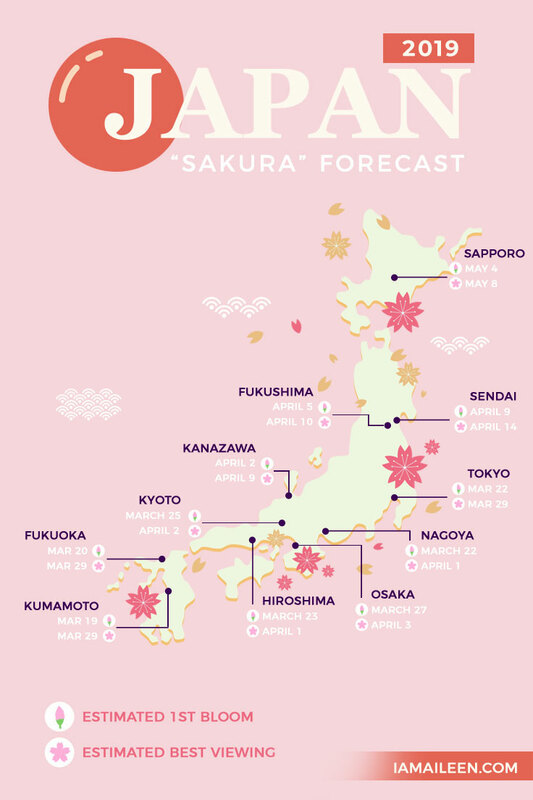 No matter if it will be your first time to the ‘Land of the Rising Sun’ or not, I hope this post has given you enough info and tips to start planning your amazing “sakura” season in Japan! Let me know how it goes for you. Enjoy! What do you think of this forecast? Would you like to go to Japan to see the cherry blossom season? Why or why not? Do you have other tips to add in case you’ve already been to Japan before in spring? I'm sure you'll enjoy them! Hi! 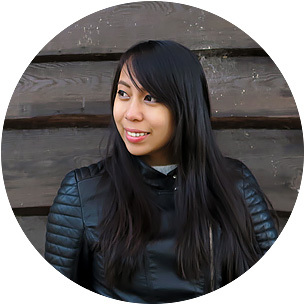 Your blog was informative and it helps people who love to travel because of how you explain and how to let us experience the traditions in Japan by using your creativity in words. Aside from that, by reading your blog it feels like I was able to go to Japan eventhough I am only in my home reading your blog. Hoping for the best for your blogging career! I can't believe that such a post exists! This is fabulous! Thank you so much! Will you update this for the next years as well? The amount of detail here is amazing, the article, the blog in its entirety, well done! I was actually hoping to go to Japan later this year, so I'll have to have a look through some of your guides here, thanks. I'm just too amazed to see these pictures from Japan! The cherry blossoms look so pretty. I think I need to rethink about my 2019 bucket-list. Hello, Ms. Aileen! Do I need to buy an Icoca card if I already have a JR Pass? I'm planning an Osaka-Kyoto-Nara then Tokyo itinerary. Thank you so much! It helps to note that ICOCA is basically just a stored value card which is helpful if for instance you're just traveling around just one place. But JR Pass is great for long-distance travels since it's already discounted, and since your itinerary is like that, I think it's best to get it. But it also helps to compute the costs of buying normal tickets for your itinerary compared to getting a JR pass so you'll see which is cheaper. Hope that helps! Hi Aileen, can you site your source for the cherry blossoms forecast?? I'm looking at other sources updated a week ago and their forecast is around 4-5 days earlier on first and full bloom. Not sure which forecast to follow now.